I appreciate Dalton Conley’s attempt here. As stressed out parents, we like to laugh. We also want to know how to do this parenting thing better. Add in scientific research to prove results and blend it all together—it sounds good, doesn’t it? Well…. The problem comes about when the reader can’t tell if Conley is being serious or is joking around. He talks about strapping electrodes to the heads of “little buggers”, but that phraseology discredits the merit of research. You can be funny when introducing or summarizing, but mixing into the research process devalues the outcome. I can’t tell if Conley’s recommendations for attachment parenting are serious or not. He talks about kids acting fine, but secretly are sending messages in the brain that they are not. And it goes on and on: naming kids, getting your tubes tied, putting your kids in special classes, being rich, etc. This book had a lot of Conley experimental thinking involved as he raised his own children. Unfortunately, this doesn’t answer the question: does it work? Other parenting books like CHILDREN: THE CHALLENGE and HOW TO TALK SO YOUR KIDS WILL LISTEN have taken decades of research and proven method to present effective parental approaches. 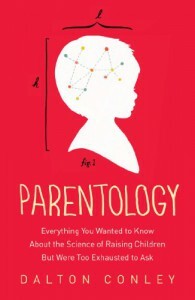 The more recent book IF I HAVE TO TELL YOU ONE MORE TIME takes this research and refines it into a loving and friendly format that parents can quickly (key word: quick) read and implement. PARENTOLOGY has none of that. At the end of the day, if I’m left confused, then the book has not achieved its goal. I want to thank Simon & Schuster for providing an electronic review copy of this book.